You stand in front of a large mansion. As you enter it, you find a note - "Valuable jewels are hidden in this house. Finders - keepers". You are however not alone. Seven other guests are also eager to find the treasure in the house. As you start exploring the rooms and discover secret passages and hidden doors, the murders begin! One after another you find the bodies of the other guests. Who among the guests is the murderer? What began as a treasure hunt has now become a race to survive. 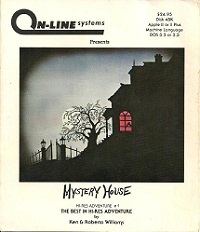 Mystery House was the very first game made by Sierra On-Line, then still called On-Line Systems. It was also the very first adventure game with graphics. It didn't have any colors, didn't have any sound and didn't have any animation, but the fact that it had graphics was groundbreaking for its time. Ken Williams had recently bought an Apple computer with the intention to build a FORTRAN compiler for it. One day he brought home a copy of the text adventure game Collosal Cave and Roberta, who had never worked on a computer before, played it through. She enjoyed the game so much that she went to a computer game store in San Fernando Valley and bought all their adventure games. She realized that she could actually make something better herself and started writing down her ideas. A few weeks later, she had come up with a story: a murder mystery which takes place in an old house, a mixture between Agatha Christie's "Ten Little Indians" and the board game "Clue". She named the game "Mystery House". She did not know how to program though, so she would have to convince Ken to help her out with it. Knowing that Ken was fully occupied with his FORTRAN project and that he may not take her ideas seriously, she lured him at their favorite steakhouse, "The Plank House", and, after a good meal and a couple of glasses of wine, explained her ideas to him. As Ken saw how passionate Roberta was about it and how the entire story was already worked out, he agreed to help her with the programming. Roberta would write the in-game text and design the graphics on a VersaWriter. She did this in the kitchen of their apartment in Los Angeles (the fact that Sierra started on a kitchen table in LA would go down in the company's history books). Ken would then program it on his Apple computer. They then made a few thousand copies of the game and put it themselves in zip-lock baggies, along with the game cover which was drawn by Roberta's mother, Nova Heuer. Ken's younger brother, John Williams, then drove around to local computer game stores with a car trunk full of Mystery House games, and demonstrated it so the stores would place it on their shelves. Ken and Roberta's idea was to sell around 10,000 copies of the game, so they could move out of LA and live comfortably in a cabin in the woods. The game was however so succesfull that just 3 months later, in August 1980, they had already bought a house in Yosemite where Roberta's parents had an apple orchard. Shortly later they got themselves an office as their home phone kept ringing day and night from fans to ask for clues on the game. Mystery House was only the first of a whole series of Hi-Res Adventures. It was soon followed by Hi-Res Adventure #2: Wizard and the Princess, which was the first computer game with colors and would become the prequel to the famous King's Quest series. Sierra On-Line was born. In 1989, shortly after Sierra introduced its SCI game engine, Roberta wanted to make a new murder mystery adventure game, using the technological advances the company had made over the years. This became The Colonel's Bequest: A Laura Bow Mystery.